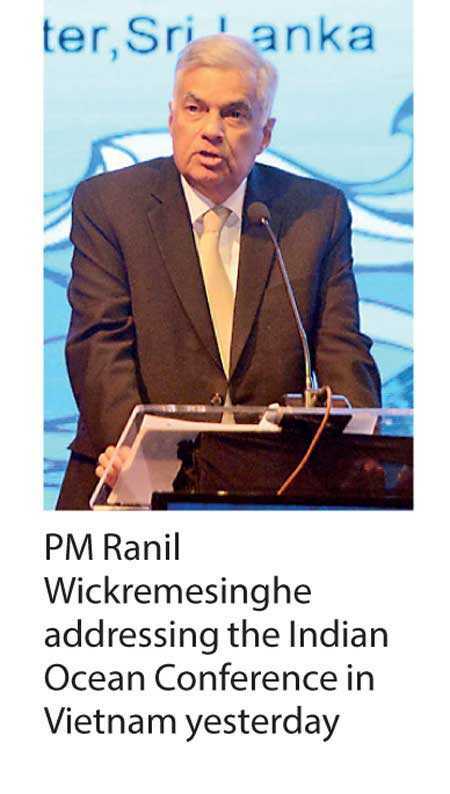 Prime Minister Ranil Wickremesinghe yesterday backed a Sri Lankan-assisted multilateral and multi-stakeholder platform to promote stronger maritime engagement in an inclusive and rules-based mechanism between Indian Ocean powers to increase dividends from economic, political and security relations. Addressing the Indian Ocean Conference in Vietnam held under the title ‘Building Regional Architectures’, Wickremesinghe outlined the challenges for stakeholders to tap into complementary traits and foster strategic cooperation and trade ties between countries, consolidate security frameworks and administrative processes, and contribute to maintaining regional peace, stability, development and connectivity. “The stability of the Indian Ocean is to our mutual interest. This region has enormous economic potential and is the lifeline of global trade. It is our view that in order to uphold order, a mechanism for cooperation needs to be explored. We also believe there is a need for the Indian Ocean to explore ways to augment cooperation across the maritime domain, such regionalism should strive to create closer linkages between ASEAN, IORA and BIMSTEC. The preference is for a rules-based order in the Indian Ocean that benefits all,” he told the gathering. The multi-layered regionalism of the future should push for inclusivity and be built among countries devoid of geographic or other constraints, he pointed out. The multipolar world of the future will be anchored by multi-layered regionalism and be built on common understanding, institutions and mechanisms that are currently taking shape. Wickremesinghe noted the world order has become more polarised, fragile and unpredictable. He acknowledged that multilateral frameworks are increasingly under pressure, the ability of the majority to manage inter-dependability is at risk, the weakening of State structures and the diffusion of State powers to non-State powers is creating a complex international environment. Under these circumstances the multilateral systems’ ability to deliver development and growth is being questioned. “Movement in multilateral trade negotiations in particular have faced significant challenges. However, for small countries there is great value in the idea of equality of sovereign states. It allows us to have a voice in how the world should be shaped. It also allows us to derive benefits from a system of trade for our people,” he said. The Prime Minister in his address mentioned how trade tensions between economic giants pose significant threats to global trade. The challenges facing the Trans-Pacific Partnership (TPP), the North American FTA renegotiation and Brexit were highlighted by him. But he insisted globalisation has helped countries across the globe to develop and prosper. The Indian Ocean has become another area of global geopolitics, he said. Nevertheless, what others see as competitiveness, the host countries see as complementary, which should result in economic cooperation by these parties to drive regional growth.